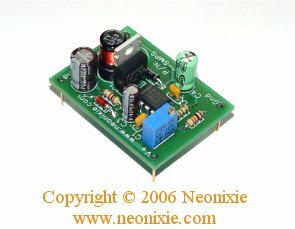 The HV-SMPS is a high voltage switch mode DC-DC converter built on the efficient MAX1771 integrated circuit. Ideal for use in nixie clocks and other projects where high voltage is needed, it provides the benefits of line isolation without the size and weight penalties of a transformer based solution. High quality components and PCB (plated through holes, silkscreened and soldermasked) make this kit very easy to assemble. Kit contains one large surface mount resistor (2010, approx the size of a 1/4w resistor body). !! HIGH VOLTAGE WARNING !! This device generates high voltage and can be lethal. Assembly and use should only be attempted by persons familiar with high voltage safety!